RYT – 500 has been practicing yoga for more than 15 years and started teaching yoga in 2014. She teaches Yin Yoga, Yoga Nidra and Slow Vinyasa. Drawing from ancient wisdom and modern science she offers classes that are mindful, lighthearted and offer respite from the stressors of modern life. Through the practice she invites students to cultivate stillness in their bodies and mind and to find centeredness in their life. Off the mat, Jenny is a mom of two boys, a children’s book author and an artist. Find out more on her web site www.jenny-schneider.com. 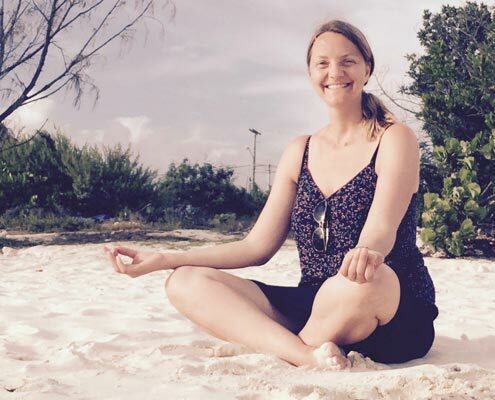 Jenny is a very kind, warm person with a soothing voice and this helps as she guides us through the sometimes-challenging poses of Yin Yoga. Jenny gives a lot of space for everyone’s individual body limitations and always helps with poses and alignment. I usually come to the yin class over stimulated and tired but I always feel more relaxed in my body and mind after Jenny’s yin class. I love the way Jenny will always start the class with some lesson that seems to connect the class with what is going on in our lives. And after guided meditations at the end of class I am able to notice a positive shift in my mind and body.